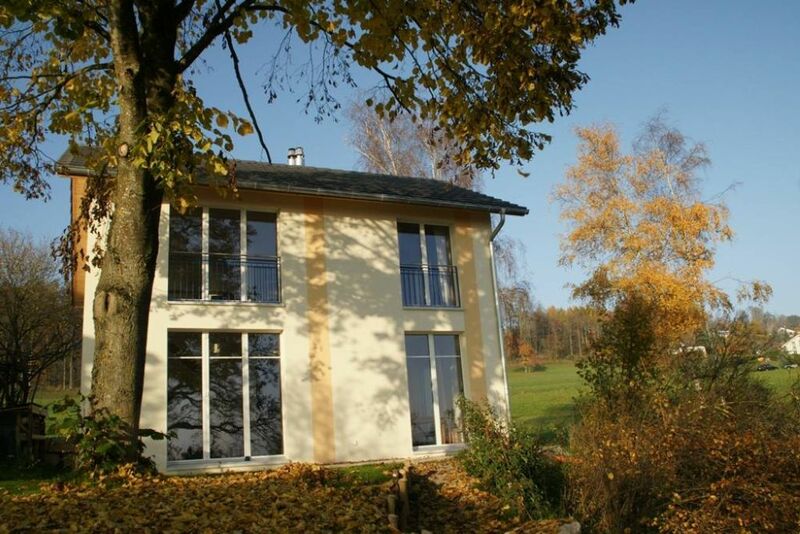 New cottage of 100m2 entirely for you , fully equipped, great view of lake and alps, situated between 2 lakes (Murten and Neuchâtel, tastefully decorated, large terrace 30m2,very peaceful next to nature resort VULLY , recent construction. My wife and I spent hours looking for a property for a month’s holiday from the UK in August. We wanted somewhere reasonably near Bern, self-contained and preferably detached, just for the two of us. Most detached properties in Switzerland are, it seems, chalets big enough for large families. In terms of its suitability for us as a couple this was a gem and almost unique! The listed description of this property is accurate. The house is of a modern timber framed structure, sympathetically furnished. It was certainly clean and everything that we needed worked. Anne and Brecht met us upon our arrival and explained everything. As a couple we found them personable and enthusiastic and, importantly, from this first meeting, we had the security of believing that if anything went wrong, either personally or with the property they would be more than willing to help. It's on the edge of a cluster of delightful villages in the wine producing and agricultural area of Mont Vully. The neighbourhood is very quiet and Chemin de Cible is bordered on one side by open fields. There are several restaurants in the area though a car is still essential to reach them. We liked the Bel-Air (it's best to telephone for a reservation) which also has a delightful café with tables between flower beds and trees right on the edge of Lake Murten. If you drive a short distance along the Route du Lac towards the top of the lake you pass a small supermarket and a Boulangerie selling amazing bread. Most shops close on Sunday but the Boulangerie is open as is also a Spar food shop attached to the petrol station near the roundabout at Sugiez. There's a large Migros supermarket on the approach to Murten. "Excellent stay. The house is well situated with a nice view. The supermarket and trainstation nearby. The building is new, the facilities are modern, clean, practical and cosy. During the night all was quiet." Wir haben dort eine wunderschöne Zeit verbracht. Ein mit viel Liebe, perfekt ausgestattetes und sauberes Ferienhaus mit wunderschönem Garten. Der Ausblick ist grandios. Die Lage ist idyllisch und die Kinder warten jeden Abend, um die Rehe am Waldrand beobachten zu können. Das Ferienhaus ist besonders gut für einen Familienurlaub geeignet. Uns fällt kein Mangel ein. Die Vermieterin, die sich sehr um Ihre Gäste bemüht, steht auch mit Rat und Tat den Gästen zur Seite. Der Abschied ist uns schwer gefallen - wir kommen bestimmt wieder. Eigentlich sollte man dieses Ferienhaus als Geheimtipp für sich behalten. Es hat eine absolut ruhige Lage mit Panoramablick auf See und Alpen, es ist mit allem ausgestattet was man für einen angenehmen Aufenthalt benötigt und die Gastgeber geben einem das Gefühl willkommen zu sein. Wir haben unsere Ferien dort wirklich genossen und bedanken uns auch an dieser Stelle für die großzügige Gastfreundschaft. Das Haus lässt keine Wünsche offen. Es ist liebevoll eingerichtet und sehr gut ausgestattet - hier fehlt wirklich nichts. Der Blick über den Murtensee auf die Alpen ist ein Traum. Das Haus ist sehr ruhig gelegen. Die Vermieter sind äußerst hilfsbereit und sorgen dafür, dass man sich restlos wohlfühlen kann. Wir kommen sicherlich wieder und können das Haus sehr empfehlen. Nous ne trouvons pas de points négatifs au sujet de cette location. L'accueil et la gentillesse de Anne et son mari était fantastiques ainsi que leurs conseils et recommandations. La maison est en fait encore plus belle que sur les photos, très bien équipée et lumineuse, avec une belle terrasse et très belle vue sur le lac de Morat. Elle est également bien située pour pouvoir visiter la région (Neuchatel, Lausanne, Morat, Bern, Gruyères, Fribourg,...) tout en étant au calme et dans la verdure. A (re)louer sans hésiter! Coming from motorway A1 take exit Murten, to Sugiez and Motiers. Climb hill to Lugnorre, next to school pass La Jordila, take the last road to your right (before the forest), last house right hand side.